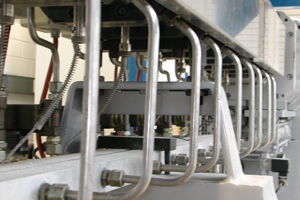 Here you can find a choice of our technical equipment for processing bio-plastics. Standard rod for tensile-, bending-, impacht- and notched bar impact testing. Standard small panel. Testing panel 60x60x2mm. Immersion rim tool incl. machine equipment. Small testing rod, small parts. Compounding of plastics and extender. incl. side feeding and 2 gravimetric dosages made by K-Tron. Mould validation, R&D tasks, formula R&D, general compounding tasks, small batch production and reactive extrusion. inkl. 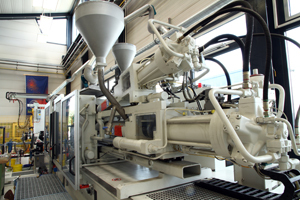 twin-rippled cooled side feeding SF25 and gravimetric dosages made by Scholz. Fast optical valuation for extrusion processes. Fast sampling and change of screw configuration (Ultra Glide).